Dødheimsgard announce details of new album. ‘A Umbra Omega’ due for release on Peaceville Records on March 16th. 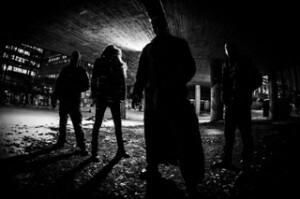 Dødheimsgard, Norway’s premier experimental extremists have completed work on their fifth album, titled ‘A Umbra Omega’, set for release on March 16th on Peaceville Records. One of the top bands and boundary-pushing visionaries of the mid-90’s Norwegian Black Metal evolution, having released 4 full-length albums since their inception, DHG are widely hailed as masters of dark & psychotic psychedelia-tinged extremity. The first fruits of DHG’s re-animated labour manifest in the shape of new studio album, ‘A Umbra Omega’, with original co-founding member Aldrahn (Thorns/The Deathtrip) making a return to the asylum on vocal duties alongside Vicotnik’s exquisite & unconventional compositions & structures. ‘A Umbra Omega’ is DHG’s first album since 2007’s ‘Supervillain Outcast’ opus, and undoubtedly marks the band’s most challenging work to date; twisted, technical, sprawling epics & an inverted outlook on existence from the depths of band mastermind/writer/producer Vicotnik, with similarities drawn to previous classic DHG works such as ‘666 International’ and ‘Satanic Art’. A raw and organic production permeates the album courtesy of Vicotnik himself, with the album mastered at Strype Audio in Oslo by Tom Kvålsvoll. Dødheimsgard was formed in 1994 by Vicotnik & Aldrahn. The early incarnation was that of a raw and melodic black metal band, with their debut album also featuring Fenriz of Darkthrone on bass, before the poisons of a more avantgarde & schizophrenic concoction started to take hold.